Zug, Switzerland and Vienna, Austria, November 7, 2018 – Today the Energy Web Foundation (EWF) announced the release of a new electric vehicle (EV) charging toolkit. This EV-focused software toolkit expands the functionality of EW Origin—a portfolio of blockchain-based toolkits for verifying and tracking the ownership of green attributes associated with electricity generation and consumption. In particular, the EV charging toolkit is focused on automatically charging electric vehicles, e-bikes, and other electric mobility solutions with clean energy and determining the avoided marginal carbon emissions based on the timing of EV charging. The toolkit provides an extension and adaptation of existing EW Origin toolkits offered by EWF to support the issuance, trading, tracking, and reporting for renewable energy certificates (RECs), guarantees of origin (GOs), and other certificates of origin that underpin renewables markets worldwide. EWF has teamed up with Affiliate Wirelane to demo the EV charging toolkit at European Utility Week in Vienna. Wirelane is a full-service provider of electric mobility solutions, including software solutions for EV charging as well as advanced EVSE chargepoint hardware. Through Wirelane’s user interface, EUW attendees can see how kilowatt-hours of electric vehicle charging are paired with renewable energy certificates and avoided marginal emissions are securely tracked on the Energy Web blockchain. 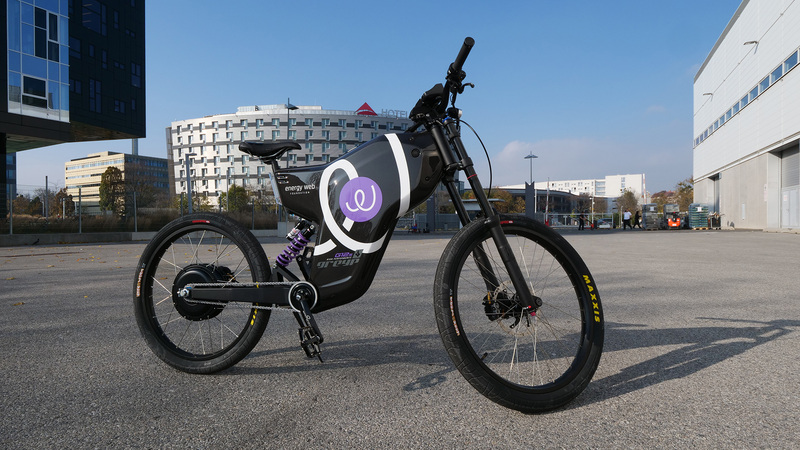 Greyp, a tech company that produces high-performance electric bicycles, generously donated an EWF-branded e-bike for the EUW demo. From greener and cleaner electricity paired with EV charging, to expanding chargepoint access across many disparate EVSE network operators, electric vehicles are fast emerging as a leading use case for blockchain-based solutions. For example, EWF Affiliate Share&Charge last week announced that it had migrated its EV charging solution to Tobalaba, the Energy Web’s test network. EWF invites EV charging application developers, EVSE manufacturers and network operators, and EV drivers/owners to learn more. EWF also recently announced jointly with PJM-EIS a landmark collaboration to build out other EW Origin toolkits into a full reference implementation for one of the largest renewable energy certificate markets in the United States. “Powering the future of mobility.” Wirelane is a full-service provider in the field of electric mobility. The company is currently active in 5 countries (D, F, S, NL, CH) and has experience with large industrial customers (VW, Vattenfall, Bouygues and others). In addition to our software solutions, we also offer specially developed charging stations that set standards through the use of advanced technology such as radar sensors and tap payment. The company works with customers from all industry sectors to develop solutions for tomorrow’s mobility needs. Wirelane is one of Europe’s leading specialist providers of hardware, software and app solutions. Follow us on the way to a clean future. Follow us on Facebook @Wirelane GmbH.